[Craig Turner] wrote in to tell us about the wireless fireworks controller he just finished building. It has eight total channels and offers the kind of safety features we like to see when working with explosives. The image above details the launcher side of the project. The project box houses an Arduino which is powered by a 9V battery. To enable this base station the key lying on top of the project box must be inserted and turned to the on position. To the left is the 12V battery which is used to supply the igniters via a set of eight relays. In the demo video after the break [Craig] is using nichrome wire to demonstrate, but we’ve even see projects that actually burn up resistors to light the fireworks. The system uses RF12 wireless modules to communicate with the control panel. That also has an Arduino, along with a number pad. After switching on the power the operator must enter a PIN code before the system will allow any of the fireworks to be launched. Here’s a new take on a gift box which has been locked from the inside. I doesn’t rely on GPS coordinates or a real-time clock to unfasten the latch. Instead, the box itself acts as a puzzle. You follow the visual and audio clues, turning the box along three axes in order to input the unlock code. There are three different difficulty settings. The easiest uses the LED heart to indicate which direction to turn the box next. This is accompanied by a beep for correct or a longer tone for incorrect movements. On the medium setting you can only go by the tones, but once you screw up the lights will aid you in getting back to where you where when making the mistake. The impossible setting doesn’t use the lights at all. 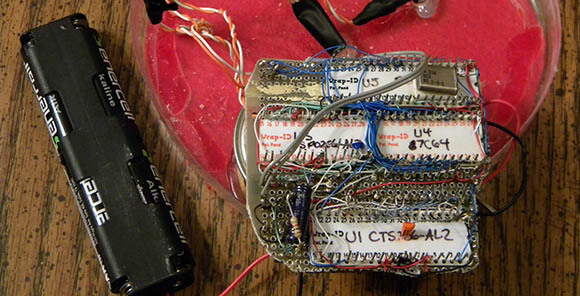 [Matt] took inspiration from some reverse geocache projects featured here on Hackaday. He already had an STM32F3 Discovery board on hand which he received as a sample. It’s driving all of the electronics inside, with the on-board gyroscope as the input device. Don’t miss the video after the break to see how well the thing works. About a year ago, [Anthony] decided to embark on his biggest project to date. He wanted something with a ton of LEDs, so when the idea of recreating the classic electronic Lights Out game came to mind, he knew he had the makings of a killer project. 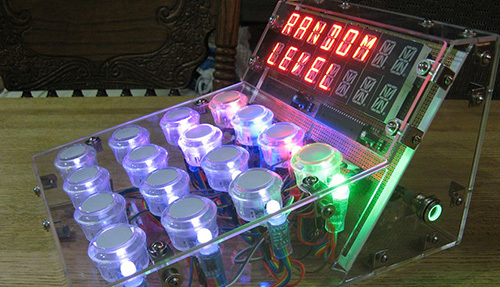 The finished Lights Out arcade box is a wonderful piece of work with sixteen 17-segment displays and just as many LED illuminated arcade buttons. By far the most impressive feature of [Anthony]’s project are the two rows of 17-segment displays. These are controlled by two MAX6954 LED display drivers on a beautiful wire wrapped board. The 16 buttons for the game are translucent arcade buttons that compliment the RGB LED strip very nicely. A great display and a whole bunch of LEDs don’t make a game, though. [Anthony] came across this article on JSTOR that told him how to create new 4×4 games of Lights Out and solve them algorithmically to get the total number of moves required to solve the puzzle. As you can see in this video, it’s a little hard to solve the puzzle in the minimum amount of moves. Still, we have to commend [Anthony] for a great project. Back in 1991, a young [Backwoods Engineer] and his new wife went to a Valentines day get together. One of the conditions of the shindig was having the guys make – not buy – a Valentines day card. Go big or go home, he though, and after a few days he had a talking Valentines day card that would become one of his wife’s most treasured possessions. The early 90s were a different time; in case you haven’t yet been made to feel very old yet today, 1991 is closer to 1970 than 2013 is to 1991. Likewise, the circuitry inside this heartfelt talking token of appreciation bears more resemblance to something from a 1970s electronics magazine than an Arduino project of today. The project is powered by an old Intel MCS-48 microcontroller attached to one of the old speech synthesis chips Radio Shack used to sell. These are, in turn, connected to a programmable logic chip and a masked ROM that translates English words into phonemes for the speech synthesizer. The entire device is constructed on a hacked up piece of perf board and a few wire wrap sockets; sturdy construction, even if the battery compartment has been replaced a few times. As for what the talking valentine says? “”OK! Hello, I am a Talking Valentine Card. “Love Is A Many-Splendored Thing” and in this case also needs batteries!” You can check that out after the break. We’ve been following [CNLohr]’s process of creating an AVR-powered microscope slide running Linux and interfacing redstone circuits in Minecraft to real world electronic for a while now, but we’re really at a loss for words on how it works. Well, now there’s a video explaining everything you want to know about this amazingly complicated and overwrought thing. The device is powered by an AVR microcontroller and Ethernet controller running [Fabrice Bellard]’s JSLinux in a browser. [CNLohr] added a few bits to JSLinux allowing him map the x86 IO ports emulated inside JSLinux to the AVR’s IO ports. This allows him to query the status – both analog and digital – using just a browser. Very cool, but [CNLohr] can also run his Minecraft server optimized for 8-bit devices on this microscope slide server to create a bridge between real electronics and redstone circuits. In the video after the break, you can see [CNLohr]’s overly convoluted walk through of what’s going on with this microscope slide server. As a little bonus, you can also catch a glimpse of Hackaday at 00:20 in [CNLohr]’s most visited / new tab thingy in Firefox. We’re honored, really. With the massive response and blog cred from his QR Code clock, [ch00f] felt it was time to step up his game and update his design to a proper commercial product. His new QR clock is bigger, brighter, cheaper, and in every way better than the old version, but these improvements came at a cost. The LED matrices [ch00f] used in his earlier, smaller version weren’t very aesthetically pleasing. He wanted the lights to shine a brilliant white, and also be somewhat attractive when not illuminated. The 8×8 LED arrays [ch00f] picked up from Futurlec had a disgusting yellow coating on each LED that turned light emitted by the blue LEDs inside to a brilliant white. This simply wouldn’t do for a commercial product with [ch00f]’s name on it, so he turned to the one place in the universe where everything was for sale: alibaba.com. After some trials and tribulations with component manufacturers in China, [ch00f] had the perfect LED matrix; not too expensive, very good quality control, and something that looked really good when both unpowered and illuminated. Now that his boards are being spun up, [ch00f] hopes to sell his QR clock on Tindie. Each 24×24 LED matrix should cost less than $100, a pretty good deal if you ask us. He’d like to know if anyone out there has any feature requests, to which we can only say he should get rid of the PCB border. Tiling a few of these displays and controlling them via serial would be much cooler than a QR Code clock.